Security Anthropology: How Do Organizations Differ? When planning a go-to-market strategy, it’s common practice to build detailed marketing and sales personas for key security individuals such as the CISO, the IT administrator, the developer, and the end user. Each of these roles has different needs and priorities when considering a security tool, and sales strategy recognizes the need to address each of them. Organizations have different types of business drivers, priorities, constraints, and capabilities as well: for example, an 80-year-old manufacturing company may not care what cute new IoT ideas you might have. These organizational personas must be considered when searching out peers for benchmarking. Security decisions made only by looking at other companies in the same industry doesn’t provide enough data, because there are many other variables that come into play. 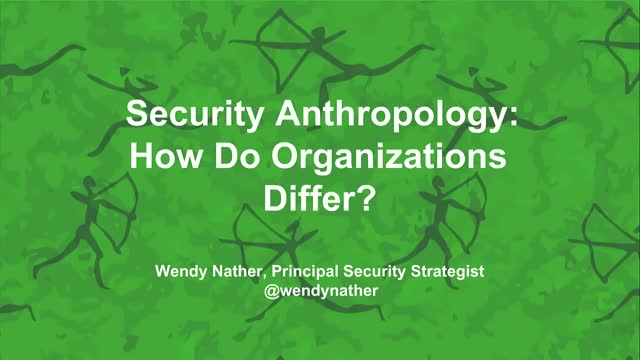 Building a security anthropology model for comparing organizations provides more context to better design products and services to align with their needs, while helping the security community speak the language of the users it’s serving. Join us for a discussion on how we can excavate a better approach with Wendy Nather, Principal Security Strategist at Duo Security. Wendy Nather is a former CISO in the public and private sectors, and past Research Director at the Retail ISAC (R-CISC) as well as at the analyst firm 451 Research. She enjoys extreme weather changes while shuttling between Austin and Ann Arbor. Title: Security Anthropology: How Do Organizations Differ?